When and how did plate tectonics begin on Earth? What was the style of surface tectonics before plate tectonics? These are the main questions driving my research on early Earth evolution. I use numerical models of mantle convection to assess how higher the mantle temperatures which prevailed on the early Earth influence plate boundary formation and mobility of surface plates. This research is inter-disciplinary, working with geochemists, petrologists, and geologists to integrate the modeling with geological observations. For example, the convection models predict that the early Earth would have been in a mobile lid regime, with sluggish, drip-like subduction. This regime is capable of explaining how mantle geochemical heterogeneities, created soon after Earth’s formation, survived for 1-2 billion years. I recently received funding for a project studying how the growth of Earth’s initial continents influence plate boundary formation and the initiation of subduction, and whether growing continents leads to a global transition to modern style plate tectonics in the Archean. Please contact me if you are interested in pursuing a Ph. D. as part of this project! Chemical mixing by mantle convection at early Earth conditions. Shown is temperature field with tracers representing chemical heterogeneity. When grainsize is fixed, as is traditionally assumed, mixing is rapid and heterogeneity is rapidly erased. 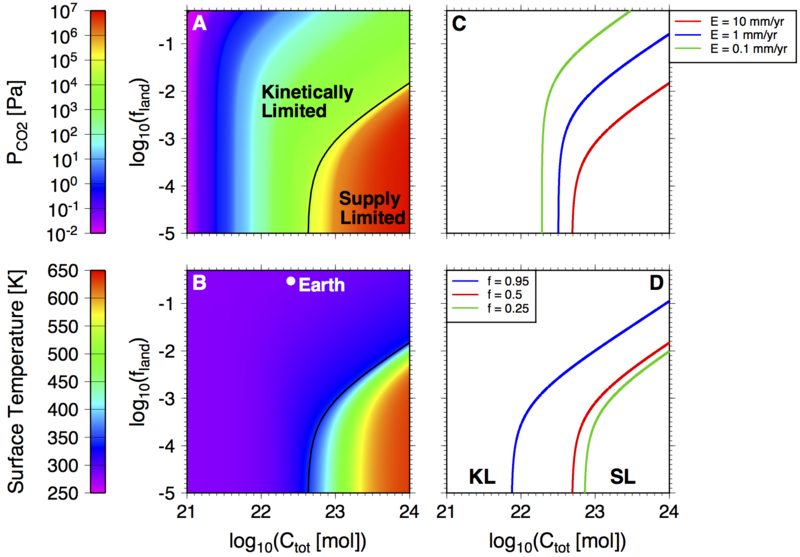 However, when grainsize evolves, heterogeneity can last for 1-2 billion years, consistent with geochemical observations (Foley & Rizo, submitted). 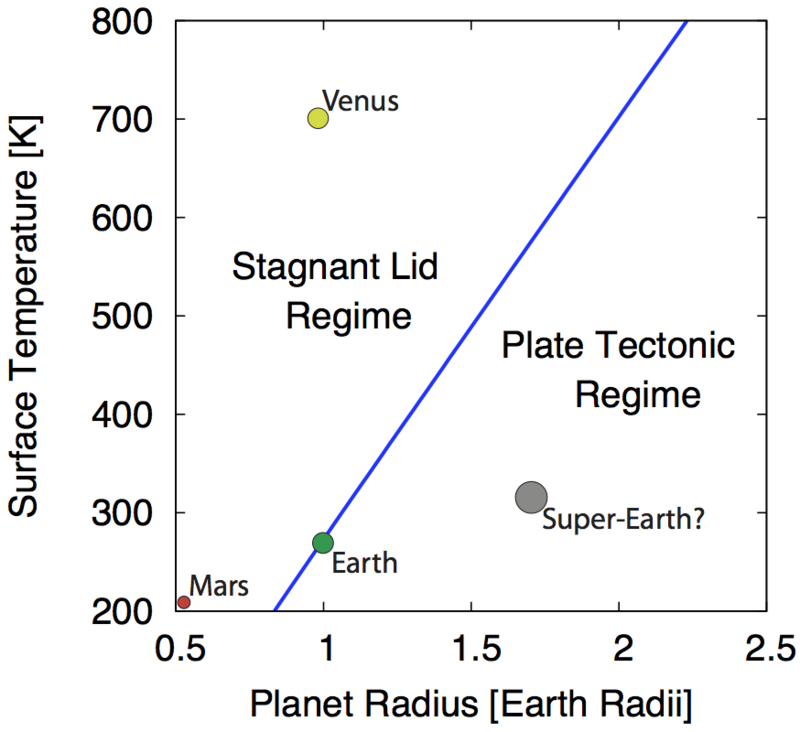 Phase diagram showing the boundary between plate tectonics and stagnant lid convection as a function of planet size and surface temperature. Plate tectonics is favored for large planets or those with cool surface temperatures, because large planets have more vigorously convecting mantles and therefore larger driving forces for forming plate boundaries, and cool surface temperatures suppress rock annealing, which acts to wipe out plate boundaries (Foley et al, 2012). Mantle convection influences climate through volcanism, which releases greenhouse gases such as H2O and CO2 into the atmosphere, and through mountain building, which drives chemical weathering, a process that removes CO2 from the atmosphere. Climate also influences mantle convection by imposing a temperature boundary condition on the convection mantle. I perform research on both aspects of this coupling. 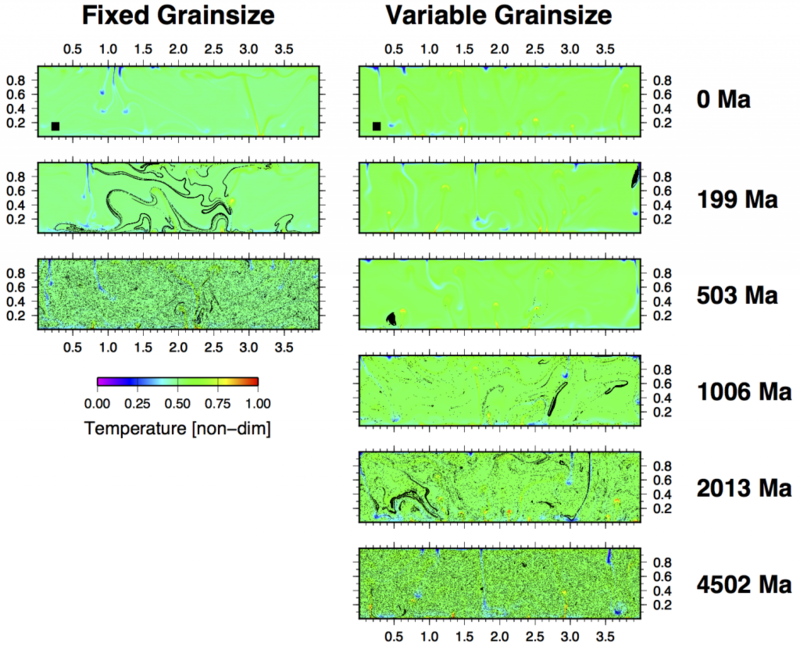 My work has shown that surface temperature can dictate whether a planet has plate tectonics or not; too high a surface temperature and weak plate boundaries can not be formed through grainsize reduction. 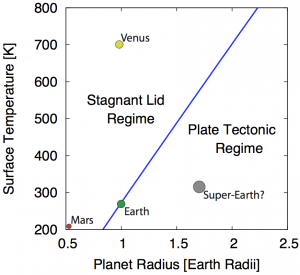 The fact that Venus does not have plate tectonics while the Earth does, despite the two planets being otherwise very similar, can be explained by the different surface temperatures. My research seeks to quantify the role tectonics plays in maintaining temperate climate on a planet through weathering, by exploring the links between surface tectonics, erosion, and weathering using theoretical models. Thousands of exo-planets, planets outside of our solar system, have recently been discovered by astronomers, revealing that planetary systems are common in our galaxy. Most of these planets are larger than Earth, and called super-Earths. One of the most important questions about these planets is whether they host life. In many ways, the interior dynamics of a planet influences whether surface conditions are habitable for life, because of connections between weathering and tectonics. My research focuses on how conditions such as the area of exposed land (versus land covered by oceans) and erosion rates influence whether a climate suitable for life can develop. I also study the coupled evolution of climate and tectonics, to map out the circumstances necessary for developing an habitable planet. Another project I’m pursuing is studying whether, and for how long, a habitable climate can persist on a stagnant lid planet (i.e. one that does not have plate tectonics, like Mars or Venus). Atmospheric CO2 (A) and surface temperature (B) as a function of total planetary CO2 budget and exposed land fraction. When weathering is kinetically limited, at large land fractions and low planetary CO2 budgets, temperate surface temperatures ensue. When weathering is supply limited weathering, as a result of a small land fraction or high CO2 extremely hot climates form because weathering can not keep pace with volcanic CO2 emissions. The boundary between the kinetically limited and supply limited weathering regimes is shown in panel (C) as a function of erosion rate, E, and in panel (D) as a function of the fraction of subducted carbon that degasses at arcs, f (where the label KL refers to the kinetically limited regime and SL refers to the supply limited regime). From Foley & Driscoll, 2016. A defining characteristic of plate tectonics on Earth is that deformation is localized to narrow plate boundaries between the nearly rigid, non-deforming plates. Discovering the reasons why deformation localizes is therefore a key to understanding why Earth has plate tectonics. Shear localization is the result of the complex manner in which rocks deform, and likely involves fabric development and grainsize reduction in rocks in the lithosphere. I use to regional scale shear zone models and global scale mantle convection models to assess how, and under what conditions, different mechanism for shear localization work, and how well they explain geological field observations of exposed shear zones.